We’ve all been there — a cake you had in mind for days turns out dry. Instead of throwing it out, change it up a bit and make it into something even better. I once made a four-layer, homemade strawberry cake with three different kinds of icing. This was just a regular Saturday afternoon for me (before kids, obviously). My joy came (and still does, only now it’s harder to find the time) from baking delicious concoctions for friends and family. In all my years of baking, I’ve come across more than one dry cake — both homemade and from a box. After tossing out one too many, I realized the dry cake can be made into something even better than what I had originally planned. Poke cakes are all the rage. There’s pumpkin poke cake, Christmas poke cake, German chocolate poke cake, lemon poke cake, and so on and so forth. What’s a poke cake, you ask. It’s very simple — all you do is let the cake completely dry, poke holes in it with a fork and pour a can of sweetened condensed milk on top. And you have — moist cake! Then, top with your favorite icing or Cool Whip and add crushed candies or sprinkles. My favorite poke cake: Bake a store-bought German chocolate cake mix and let cool. Poke holes across the entire cake and pour a can of sweetened condensed milk over it. Refrigerate 2 hours. Top with Cool Whip and crushed Heath bar bits. Enjoy! Simple syrup is equal parts water and white sugar. Combine both in a pot, bring to a boil and stir continuously until all the sugar has dissolved, then let cool. Transfer into a spray bottle and spray the dry cake with the simple syrup. This works wonders for moistening up a dry cake but doesn’t add as much sweetness to the cake as pouring sweetened condensed milk on top does. Ah, the infamous cake pops. We’re certain you’re familiar with cake pops, and possibly terrified at the thought of trying to muster up your own (let’s face it — most that we see on Pinterest are worthy of an award). But nonetheless, a dry cake makes for the perfect cake pops, and we like to keep it simple. Here’s how to make them: Crumble the cake into a bowl and add in your favorite frosting — store-bought or homemade. Mix well and form into balls. 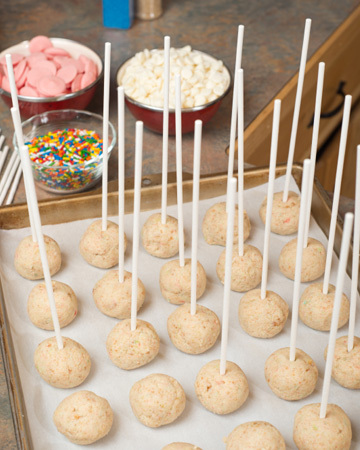 Place the cake balls onto a baking sheet, put a toothpick in each and freeze for about 30 minutes. Next, melt baking chocolate (white or dark) and dip the cake balls into the chocolate. Top with sprinkles or candy, as an option. Place in the refrigerator for a few hours and you’re done. Easy peasy! And finally, if you don’t feel like transforming your cake into a poke cake or cake pops, you can simply spread some melted butter on top. Let it sit for a few minutes to soak in, and then frost away. No one will know your cake was dry.